Until now, we have always just had a single, simple “Search” feature here at Shockwave-Sound.com. This was fine years ago when we had only a thousand or so music tracks and sound effects. But as the years have gone by, adding new music and sound effects every week, or catalogue has grown to such a volume that it is sometimes necessary to go “deeper” in Search to find what you need. We’ve had this in the back of our minds for some time, but the “kick in our behind” came one day recently when a customer wrote in to tell us that he was trying to find a “ding!” sound for a Powerpoint presentation, but when he searched for “ding” in our old, simple search box, he got 662 results, of which most were music tracks. The simple search box searches through all track titles, descriptions, keywords and — for example — it will produce a search result that includes every music track where the word “ending” appears in the description of that track. A link to the new “Advanced Search” feature can be found directly underneath the simple search box. Once on the Advanced Search page, you’ll see some options that should be pretty self explanatory. You can search only in Music Tracks, or only in Sound Effects, or both. You can search only in 24-bit, High Definition audio files, or you can choose to include also 16-bit, normal CD-quality audio files. 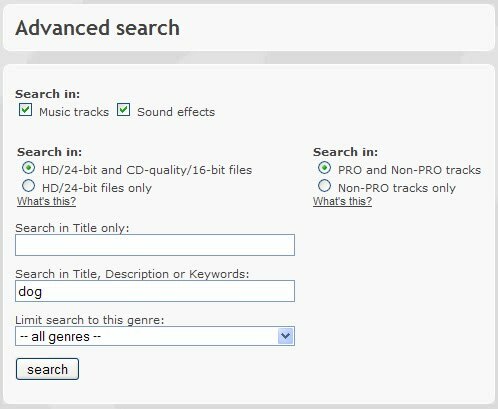 Note that there is no option to search for only 16-bit audio files and not include 24-bit audio files in the search results. The reason for this is that every purchase of 24-bit audio files always includes also the 16-bit equivalent file. So if you are unable to use 24-bit files in your system, you can still include 24-bit files in your search, because should you buy the 24-bit file, you automatically also get the 16-bit file included. 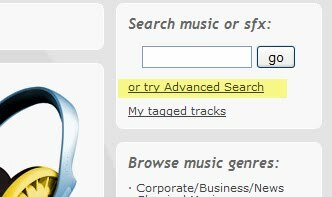 You can search in Non-PRO music tracks, or PRO-registered music tracks, or both. “PRO-registered” or “Non-PRO registered” basically means whether the composer of that music track is a member of a Performance Rights Organization such as PRS, ASCAP, BMI or similar. If the composer is a member of such an organization, the music is still royalty-free for almost all uses, but in some rare cases, additional licensing may be necessary. If the composer is not a member of any Performance Rights Organization (i.e. the music is “Non-PRO”), that means the music is entirely royalty-free for all types of use. You can make a search in Title only. This is the best option if you know the track title, or part of the track title, you’re looking for. Or, you can make a different search that includes the Title, Description, Keywords, or Composer. This is useful to search for, for example, a mood (try a search for “romantic”), or an instrument (try a search for “acoustic guitar”), or a composer (try a search for “Arjun Sen”) or even a music style (try a search for “hard rock”). Finally, you can limit your search to only a particular genre. For example, you can select the genre “Rock music” and search for the word “melodic”. Or, you can select the genre “Classical music” and you can search for the keyword “romantic”. You get the idea. Keen followers of Shockwave-Sound.com may have noticed that a new track sorting option has been added to all our Genre pages, and that this new Random order option has been made the default track ordering / display option when browsing our music genres. By “Genre pages”, I mean the page you come to if you click, for example, “Chill-Out Grooves” in the long list of music genres you can see displayed on the right-hand side of our site. The reason why we added this functionality is, mostly, to give older tracks a chance to be heard, even if they are no longer among the 20 latest tracks added to that genre. Previously, whenever you browsed a genre page, you’d see the 20 most recently added tracks, and the older tracks followed on subsequent pages. When I say “older tracks”, the track doesn’t have to be old; it only has to be older than the 20 most recent additions – which doesn’t take much, if we’ve added 20 tracks today! So, a track could have been added to the site 2 days ago, and already, it was considered “too old” to be on the first page of a Genre music listing page. We felt bad about this, and that’s why we added the “Random order” sorting function. The “Most recent additions on top” track sorting option is still available. Just click on top of the genre page where it says “Newest additions at top”. Furthermore, an “Alphabetical” and a “Most sold at top” option is also available. The “Random order” ordering is re-shuffled once every 24 hours. So, if you come back to a genre page later today, you’ll see the tracks in the same order. But if you come back tomorrow, they will be in a different order. Shockwave-Sound.com founder, CEO and composer.